The dawn awakens down by the lade and through the pale light of the morning sunrise I look up from the grassy banks and see a dark and mysterious silhouette forming in the midst of the trees. Trees bereft of their leaves and so old that they could tell many a story I’m sure. Is it a large house or a mansion you might ask? Nay its a castle full of intrigue, secrets and legends from medieval times. It’s a place where Mary Queen of Scots frequented and spent her honeymoon. 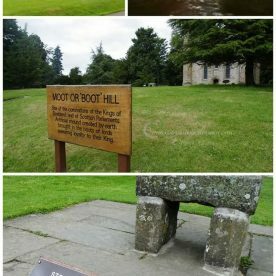 A place where her son the young King of Scotland James VI, was lured to in 1582, and then kept captive for over 10 months. (KJV bible was named after this King). A castle where plots, conspiracy and murder were devised and the masterminds eventually hung, drawn and quartered by the Kings royal decree for high treason. 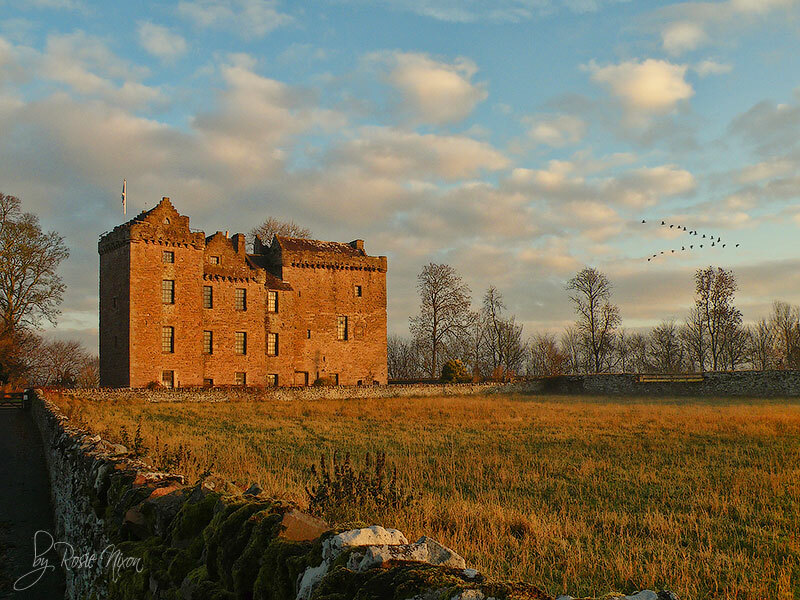 A place where the family name Ruthven and their castle – The Place of Ruthven was forfeited forever due to being traitors of the Crown and the castle renamed Huntingtower. It’s a place of romance where a young maiden named Dorothea was in love with a servant in the castle. What a scandal!Where a mother heard rumours of a secret love affair and tried to find out if it was true one night. That same night Dorothea who was in her lovers chamber heard her mother’s footsteps in the servants quarter. She got up unto the roof of the tower and leaped from one tower to the other a distance of over 9 feet. She returned to her bed in the other tower undetected. A much relieved mother found the servant asleep alone that night but the very next day the couple eloped never to be heard of again. It’s a place where weddings takes place today and the sound of bagpipes can be heard floating down the valley in celebration of the event, something Dorothea could only have dreamed of. It’s a place of legends where a tall lady called Ma Lady Greensleeves dressed in green silk is said to walk the grounds and her omen is a forewarning of disaster. One unfortunate traveler in 1930 claimed to have seen her in the castle corridors and alas he drowned the next day. Some say that it is Dorothea who walks the grounds of the Huntingtower. It’s a castle that once was two separate towers – its a tale of 2 towers! The land was shared between 2 brothers each wanting a tower of their own only in later years for another resident family to join the 2 together. It’s a castle that became run down and forgotten and sold for 11,000 pounds in 1805. No longer fit for royal circles but used instead as accommodation for the workers of the nearby John Buchan cloth-printing factory down by the Perth lade. Stones taken from the old walls and outbuildings were made into new homes in the valley below. Still neglected and forlorn it was finally sold to the state in 1912. 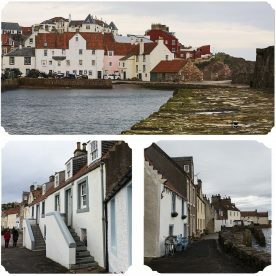 Now Historic Scotland look after the medieval building and tend the herbaceous borders making sure that its memories and history are kept alive for all who come to visit. 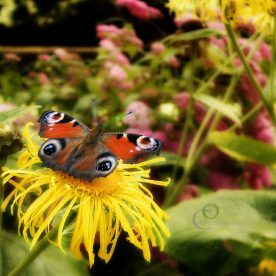 Rosie is based in Perth, Perthshire as a garden photographer, writer and nature lover. She enjoys soaking up nature in her own garden and is easily distracted from doing the weeding by anything that flutters, flies, buzzes, creeps or crawls! She enjoys sharing the beauty of creation through her photography. Rosie has been featured on TV on BBC2's The Beechgrove Garden and she uses the Scottish outdoors as her natural light studio. 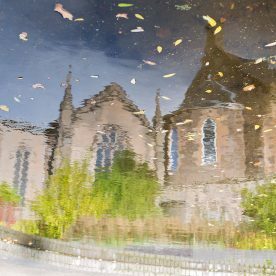 Her work can be seen at the only photographic gallery in Scotland - Close Gallery, 4b Howe Street, Edinburgh. Its all in the eye of the beholder! Dear Rosie, I am most intrigued with this posting and feel that I am rapidly extending my knowledge of Scottish history through you. I have friends in Dumfriesshire and know the border country a little, but now feel I should plan to explore further. There is obviously much to see. Nice post and I am imagining the bagpipes music, the kilts and the accent…. nostalgic! Thank you so much for this posting. I have always been fascinated with medieval times.I am glad that this part of it is kept up. You live in a land that has a wonderful history. Wonderful story. I cant wait for the second part. I would love to visit Scotland one day. And thanks for the link to my blog. What an evocative tale you weave. It makes me dream of olden days. I think I could jump 9 feet (or I could when I was younger) for the love of my life. Thanks for the history lesson. It was delightful. thank you for telling us all the stories about this castle, it was all told very well…now do i get my chocolate for sitting still??? No interesting tales like this, for sure! Best I can offer about my own place is that the man who built the house, Henry Thorpe, is a ghost here, apparently. A friendly ghost, though he does cause my Spunky Boomerang cat's eyes to get that staring, 'what's that!?" expression on a regular basis. I used to read a lot of historic fiction books, but your stories just bring it all to life:) Thanks for history lesson. So enjoyed my visit via jodi's. The outline view of castle, stunning! I loved this post, Rosie. What a wonderful castle. We had a great time at Doune last summer – oh, and Tantallon, watching the gannets on Bass Rock. It would seem that this Huntingtower has nothing to do with the one in the John Buchan novel. All the same, it conjures up images for me of Wee Jaikie et al. Well, I enjoyed reading that! I came to wish you a Happy Christmas because I'm catching up on my Christmas-Comment-Correspondence. 'Happy Christmas' seems a bit dated now – so I'll wish you happy blog-writing instead. Medieval times are so utterly fascinating. Thanks so much for your post, both for its intriguing story and the lovely photos that accompany. I watched "The Other Boleyn" a few weeks ago, and was entranced. Oh those times, they were so very different from our modern days! Hi Roger B and thankyou for the welcome. Edith: get travelling further north – the scenery is amazing, loads of castles and beautiful walks – the east coast is my favourite. Bangchik: bagpipes playing is a regular occurance around here – I can be in the garden and hear it wafting by on a summers afternoon. Glad you enjoyed the post Lona and congratulations on winning over at Tootsie's place. Tammy I am glad you enjoyed the article as it was you that started me on this – part 2 might be a little later once the castle gardens come to life again. Hi Noelle – I never really appreciated history lessons until I had my own children. Hi Jodi glad Mr Thorpe is friendly! Melody I'm glad you enjoyed it – I enjoyed writing it. Carol – I saw over on your blog that you did weddings – I am sure you get alot of pleasure from that – you have such lovely scenery surrounding your farm. Andrea – you're welcome here anytime – I've just been over at yours seeing the solanum. Hello Joey good to meet you – early morning is stunning especially in the winter when all the leaves are off the trees – its sort of hidden from that view once the trees are in full leaf. Caroline – you are very welcome over here at LnB. I had an inkling last night when I was over at your blog that this post might interest you. Now unto John Buchan … I am going to go to the library about this as I think there is a connection – he has some leap in his book aswell. John Buchan who wrote the 39 steps and Huntingtower from what I can figure out was born in Perth – so maybe his family owned the printworks and maybe it was this castle afterall that gave him the inspiration to write the book. One website says that Huntingtower is mentioned in Ivanhoe – I can't find it in there and was wondering if they had made a mistake and it was from John Buchans book – not sure at all but determined to find out some day if there is any connection. Esther thankyou for visiting – your world war memories are really good – my grandad was the same he went into gardening instead too. 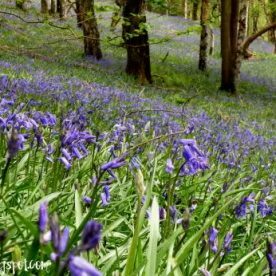 Hi Oz Girl – good to meet you – I think you must have found me through Nature Network – I think your photos are great on your blog. I'm very much an amateur when it comes to photography but getting better. I love watching all those historical things on tv too. The Other Boleyn was wonderful wasn't it sooooooo good. What a beautiful photo! I really like your blog design, as well. I love the Maiden's Leap! Ah, to be young and in love. In fact, I'd settle for just being young again. I oubt I could walk 9 feet without needing a nip from the hip flask! Romantic, dark, and haunted…what a wonderful tale of an ancient place. We have nothing like that here in rural northwest Ohio…maybe a haunted barn. Thanks for such an interesting historical look at a fascinating place. After all its history, I'm glad it's being preserved and maintained. Rosie, thanks for the welcome at Blotanical. As someone with Scots blood in my ancestry, I loved reading this post. Keep up the good work and I'll be stopping by again soon! Beautiful prose & stunning photo! Nice bit of history there. With the great pictures, that was an interesting read. Rosie, Oh to live near a castle! My hearts desire. I'm enthralled with British history and come from a long line of quite interesting ancestors from your wonderful part of the world. Please keep writing about your area's history, it is fascinating. Our areas history isn't quite old, Our town was founded in 1789. During the Civil War it changed hands (from Union to Confederate) seven times.I'm sure there are many human interest stories somewhere in there. Welcome to Leavesnbloom …the home of nature, gardening and floral photography. It’s where Rosie Nixon captures the beauty of creation in Perthshire, Scotland.